Filed to: Exo-what?Filed to: Exo-what? A blogger in the field is only as good as his (or her) backpack, so I'm keen on seeing how these freaky looking Logitech Kinetik bags turns out. I love ballistic nylon and a polyurethane "exo-shell" as much as the next geek, and the lumbar support on this baby looks nice and cushy, for those multi-meeting running-around-NYC days that I've been having too many of lately. Both will cost $100, shipping in September. Jump for details including, uh, "system requirements". Or just have a look at the pretty pics below. Logitech's two new premium notebook bags—the Logitech Kinetik 15.4 Backpack and the Logitech Kinetik 15.4 Briefcase—offer a stylish and comfortable take on the traditional notebook bag. Both cases have an exo-shell construction, which protects the laptop from damage, and a unique expanded-access compartment design to provide instant, easy access to the laptop and other equipment. The backpack features a contoured back panel, which conforms to the back, while the briefcase features a cushioned back panel for comfort padding. Made from lightweight, black, durable ballistic nylon and polyurethane, these notebook bags are easy to carry and built to last. • Exo-shell casing protects notebooks without adding extra weight, or hard edges. • Contoured back panel conforms to your back for supportive, comfortable transport and unencumbered movement. 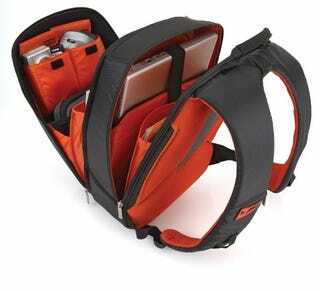 • Expanded access with a unique fanned compartment design gives you instant, easy access to your notebook and other items. Top-loading notebook and document sleeves ensure that everything stays in place with you're on the go. • Internal cargo bays provide structured storage to organize and secure key accessories and equipment. • Padded shoulder straps for comfortable transport.